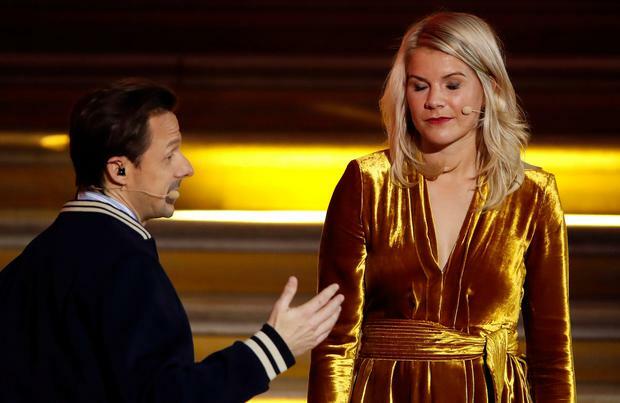 Ada Hegerberg admitted she gets frustrated at sexism in football just before she was controversially asked to 'twerk' on stage as she was announced as the first ever winner of the women's Ballon d'Or. When receiving her award, the 23-year-old Norweigan gave an empowering speech as she called on girls around the world to believe in themselves. Then, as she was leaving the stage, French DJ and co-host Martin Solveig asked her if she could twerk, but the three-time women's Champions League winner abruptly said "no" before walking away. Ironically, before the ceremony, Hegerberg, who scored 53 goals for the club in 33 appearances last season and has 14 in as many games to date during the current campaign, was asked about sexism in football. "Sometimes it's really frustrating, I must say. Sometimes you have episodes or situations where you feel like, 'damn, we're in such a man's world'," she said. "But at the same time I've never looked at myself different from a man's footballer. I've always felt the same. "I work hard to try and achieve my dreams like every other girl out there and that's the way we have to look at it."